It was in the year 1974 that Rabbi and Mrs. Zalman and Esther Grossbaum arrived in Toronto to undertake the direction of the newly established Chabad Lubavitch organization. Starting with a modest building on the corner of Bathurst and Edinburgh Drive in North York, Rabbi Grossbaum ventured out to bring the light of Judaism to the streets of Toronto. Since then, Chabad has grown by leaps and bounds. From our humble beginnings over 40 years ago, we now offer over 3 0 centres throughout the GTA and Southern Ontario. In every Chabad centre - whether in Ontario or elsewhere - you will always find people who are passionate about Judaism and Jews. 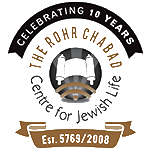 Click here for more about the Chabad-Lubavitch movement.